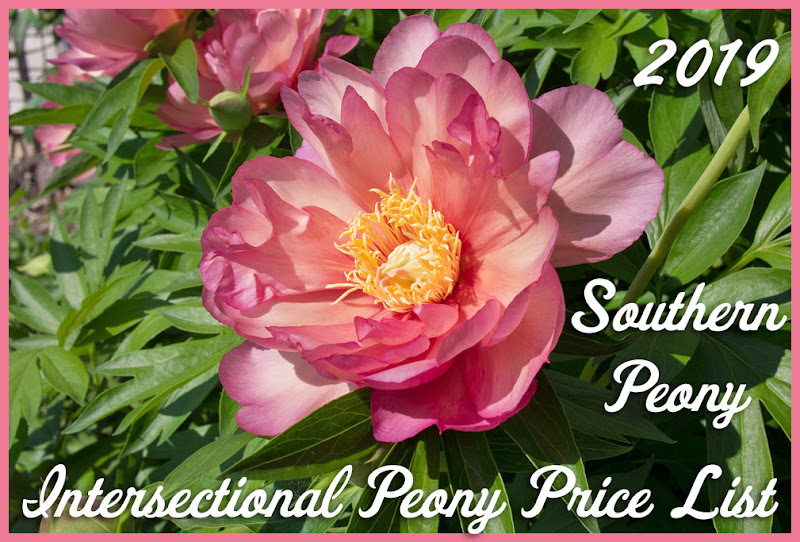 The topic everyone has been dying to find out about... How to Divide an Intersectional Peony. 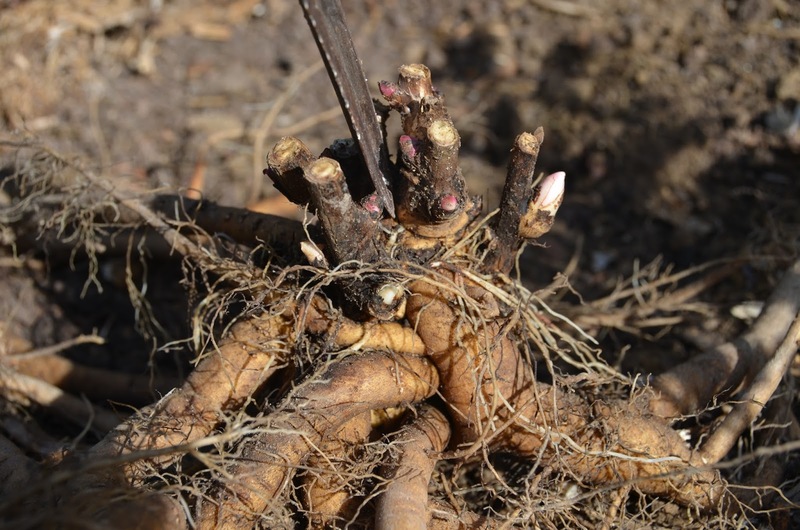 Some have claimed that it's impossible, that the roots are so different than an herbaceous peony, that if you wait too long its too late. The rumors about dividing this plant have swirled, making dividing these beauties at once a mystery and almost no-no among home gardeners. However these plants are just as easy to divide as herbaceous peonies and perhaps adapt a bit easier to it. And who wouldn't want more of these long lived, easy to grow, and floriferous peonies in their garden? 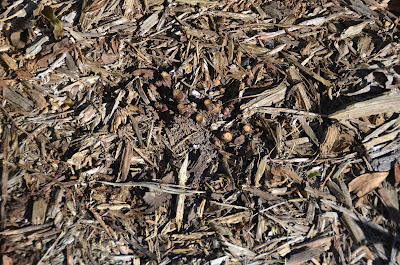 The first step in dividing your intersectional peony is to remove the ground covering or mulch from the soil surrounding the crown of the plant. You'll want to dig 8-12 inches away from the crown, depending on the size of your plant. I never measure this distance. I mostly eyeball it and use my gut feeling. 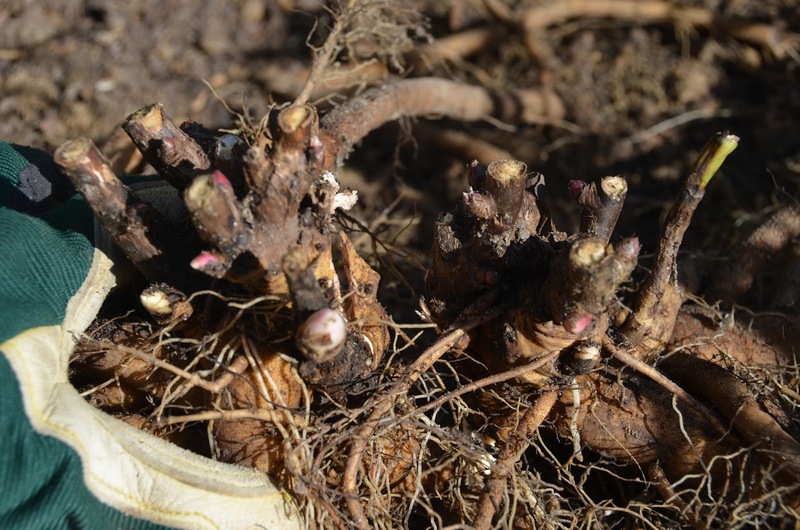 You don't have to dig up all of the peony's roots. You just need to dig up most of them. 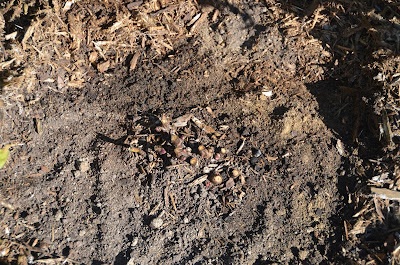 After the mulch has been removed, start digging around the plant. 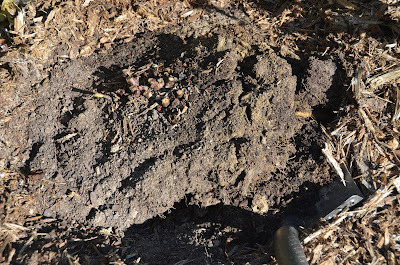 I usually just start by making cuts into the soil with the shovel in a circle about 8-12 inches out from the plant. 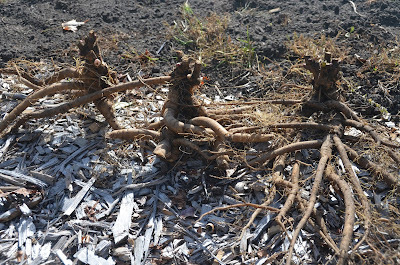 Don't worry if you hear a few roots being cut through. This is just part of the dividing process. However if it feels like you are cutting through lots of roots and the cuts are hard to make, you may be digging too close to the crown. Try making your cuts a little further out. 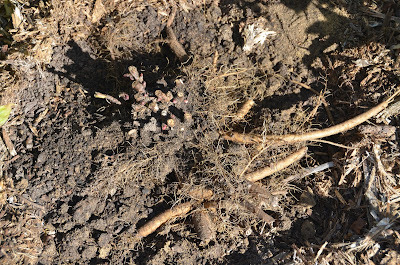 After I've made a few shovel cuts into the soil around the plant, I'll go around the plant again and do small test lifts of the rootball to see if the plant is starting to loosen out of the soil. 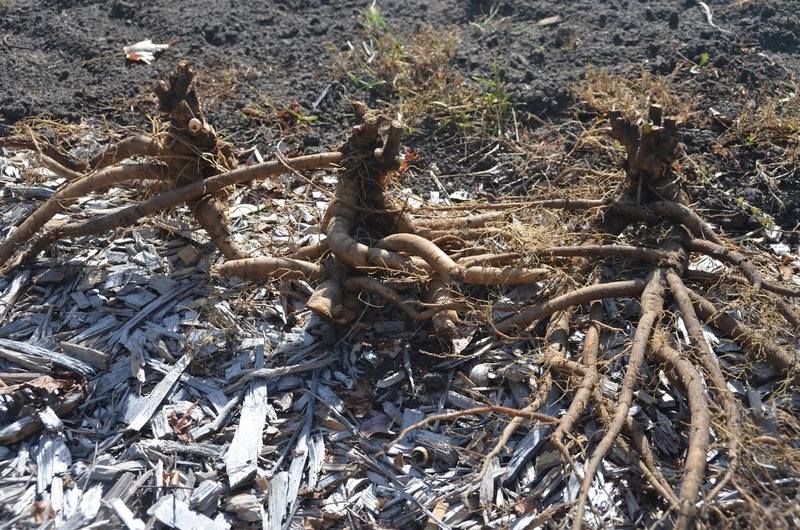 By making these small cuts and doing test lifts, I can see how much more digging I need to do, or if the plant has become loose enough to begin to lift. 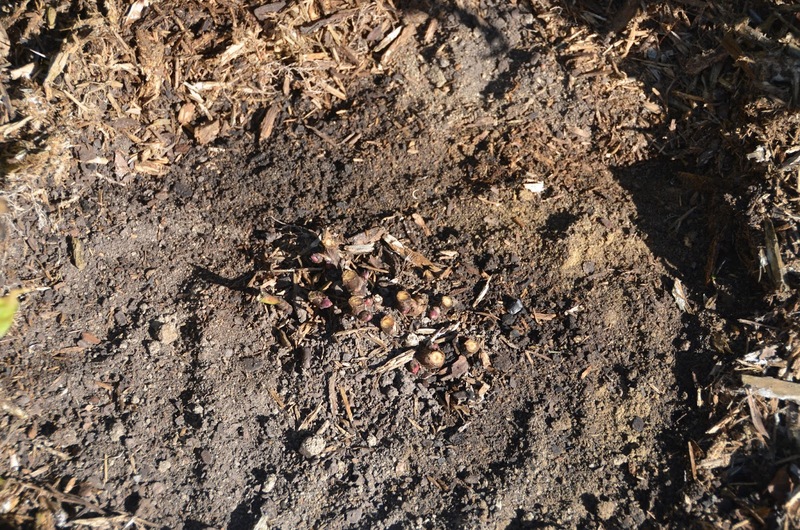 You can also get an idea as to whether you should be digging closer or farther away from the peony crown. Once the peony is loose enough to begin lifting, I'll begin gently lifting it out of the soil by hand. If there is one side that lifts higher than the others, I will try to lift that side out first. 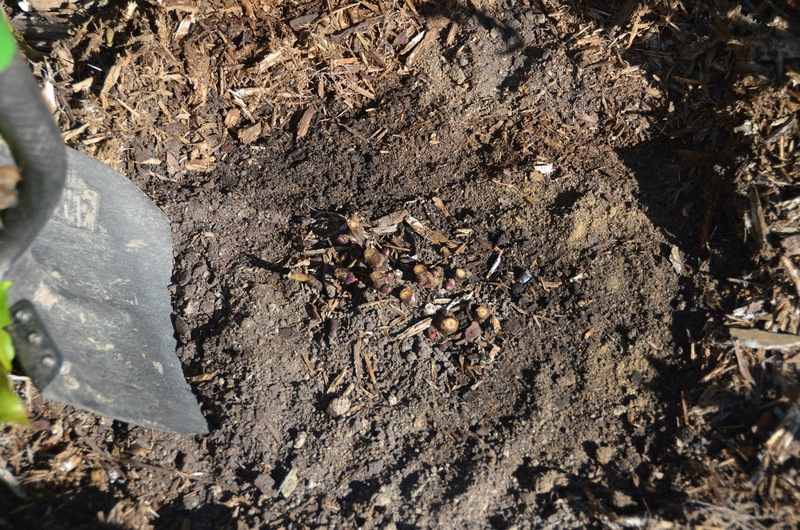 If you find that the peony is still too buried to begin lifting, you may have to go back dig around it a little more, making few more cuts with your shovel. 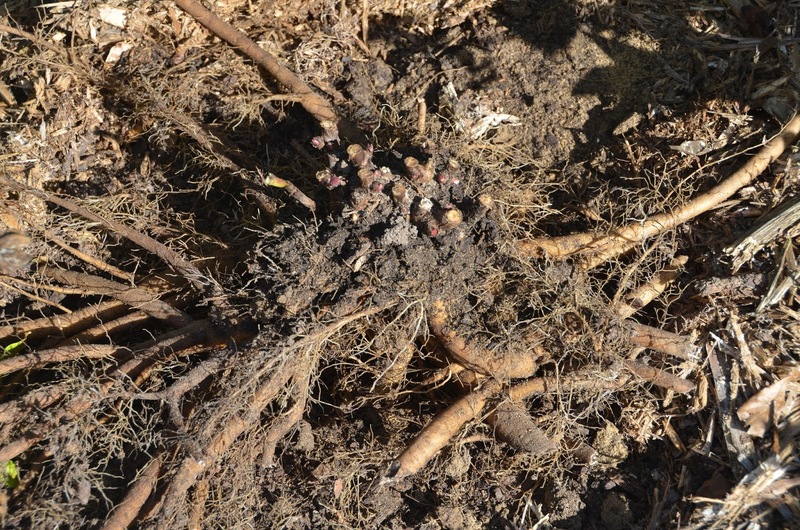 The next step is to select a place to divide the intersectional peony root. 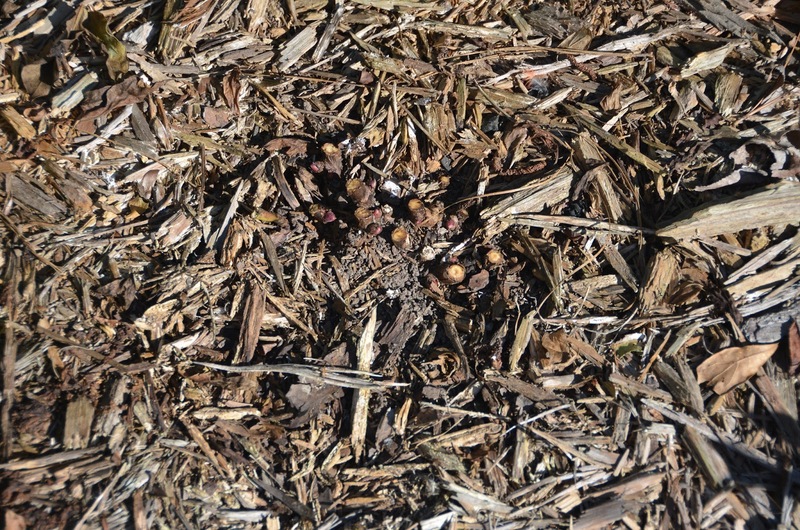 Often there will be a gap or space between some of the small clusters of pink buds. A space like this somewhere near the center would be a good place to start. I like to find a place like this and stick my dividing knife there. Also don't fuss too much about finding the "perfect spot" to divide the peony. 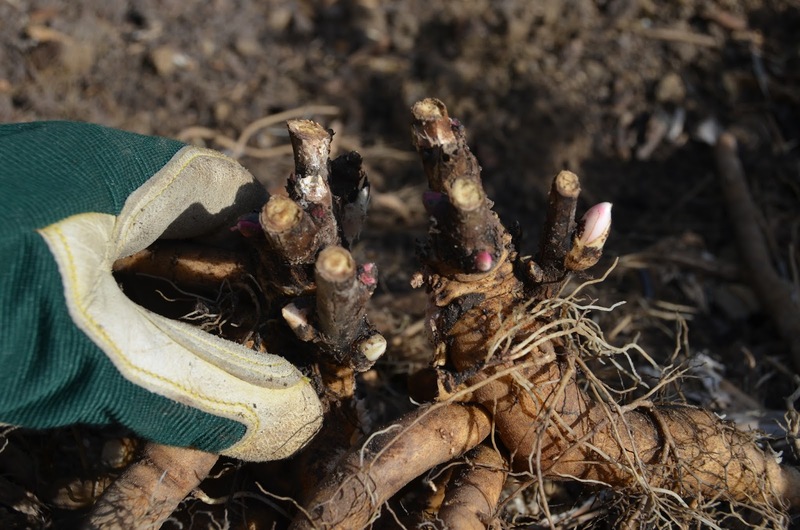 Even if you make a mistake and cut a small piece off, that small piece will likely grow anyway, providing there's a small piece of the crown (hopefully containing a pink bud) with a small piece of root attached. Then you'll just have an extra "baby" division. This small division may take longer to grow to full blooming size, but it will be one more intersectional peony plant than you had before! Often the intersectional peony roots are too hard to split by hand. I think this attribute is what may have caused the rumors that these peonies are hard to divide. 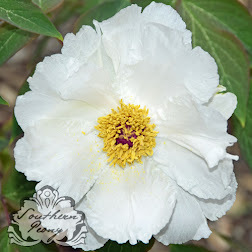 However intersectional peonies are no more hard to divide than herbaceous peonies. They may require an extra tool (like a rubber mallet), but that tool may actually make the job a little bit easier. 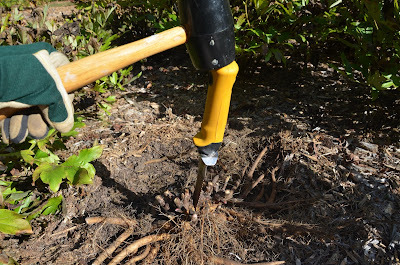 Use your rubber mallet to tap the dividing knife into the peony root in the place where you've decided to make your first cut. 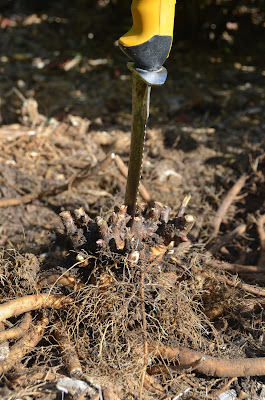 I usually do not try to put my dividing knife all the way through the peony's crown. Usually the peony's storage roots are intertwined and growing all around and underneath the peony's crown. Once the dividing knife is halfway or 3/4 of the way through, I will try to wiggle and pull the pieces apart to prevent further damage to the storage roots. If you find that you are unable to pull apart the pieces, then you may need to cut a little further or in a slightly different spot in order to separate the two divisions. After you've made your first division, then you can examine the remaining pieces to see if you can find any other gap or spaces between buds that seem like a suitable place to divide the root even further. Repeat the steps above to cut and carefully pull apart any additional divisions you choose to make.